This photo shows the first D produced, VIN 85501, considered a prototype. It had the "Speedster D" script on the left side only. The color was Ruby Red. There is an unknown object attached to the driver side windshield pillar. View a much larger version of this image. This photo is also of 85501, with the top up. This photo shows 85502. Built for US export, for a brief period it was owned and driven by Ferry Porsche before it was shipped to a dealer in San Bernadino, California and sold. 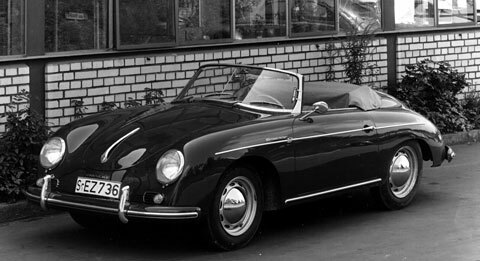 The car reportedly had a special twin grille decklid and definitely had the Speedster script on both sides. The color was ivory, and the car was a Super. View a much larger version of this image.